What species of loup do toi like the best? Would toi like to see a wolf+fox hybrid? What is your favori type of wolf? Favourite Film/Series where loups appear? rejoindre my pack i am a white loup with blue eyes named crystal commentaire if u wanna be my mate ou pups ou part of my family yes ou no will u rejoindre my pack???? what are good loup names meaning 'warrior'? how to make a profil picture? Kerouh and his pack have been traveling for a few hours and it was close to dusk, he was just about to stop and rest when he saw a human den. His ears perked up and he let out a fearless snarl. He called his mother, she quickly saw the worry upon his face, she nervously walked towards him " look... a human den, I'm going to check things out and when I return we will carry on" he a dit and paded away silently. After spending his time alone in the forest, he went back to the tanière, den to freshen up. Then a light grey wolf, with a brown marking around his eyes, like a mask with light brown eyes, walked up to Kerouh. A dark grey wolf, with orange eyes and a flash of three scratch scars going from his forehead to his right cheek trotted out of the forest with a buck’s leg in his mouth, followed par his strongest pack-mates ready to go to their arbre tanière, den not too far from the hunting grounds. 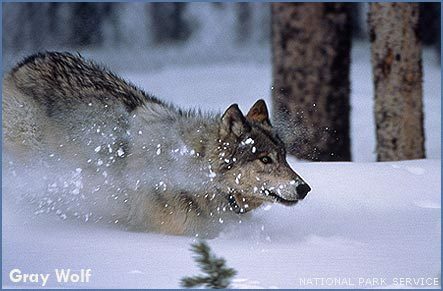 Gasping for breath, the grey loup raced through the trees. Without warning, two loups stood before them, teeth bared. As they came to a sudden stop, half a dozen loups emerged from the forest. The fresh scent of renard ran up her nose, and the she-wolf lifted her feeble head. It was almost her time to give birth to her first litter of pups. Suddenly, the bushy fourrure of the renard was visible. The she-wolf growled, and the renard ran. "Oh, thank Deo!" She cried aloud, the renard wouldn't be trouble. Snow was gently falling outside of the den. As she lay in wait, her first twinge in her belly made the she-wolf yelp, surprised. The alpha loup is a figure that looms large in our imagination... but the alpha loup doesn't exist—at least not in the wild. this loup gets save par a person but.. there is a baby wolf!!? Who reproduces in a pack?